As the name implies, the Sienna Plein Air All in One Pochade Box is designed to carry all the essentials for a day of plein air painting. It has all the features of Sienna's regular pochade boxes, as well as some exciting additional features. Designed to carry all the essentials for a day of plein air painting, the Sienna All-In-One Pochade has all the features of the regular Sienna pochade boxes, with some exciting additional features as well. It includes three 12-1/4" × 3-1/4" storage compartments, each large enough to hold eight 40 ml tubes of paint. 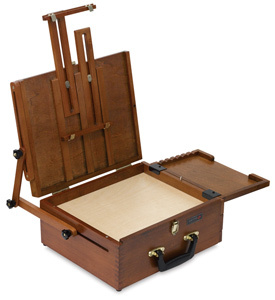 It also includes a wet panel storage compartment that allows you to carry two 8" × 10" or 9" × 12" paintings. A handy brush tray attaches on the right or left side of the box and stores on the back of the lid with magnets. It's ideal for holding wet brushes, palette knives, and palette cups. Also included is a paper towel holder, which can be hung on the front edge of the box and holds a standard roll (not included). This pochade box measures 5-1/2"H × 14-3/4"W × 11-1/4"D closed and weighs 6.8 lb. It includes a 10" × 12" birch palette and accommodates a canvas or panel up to 17"H.